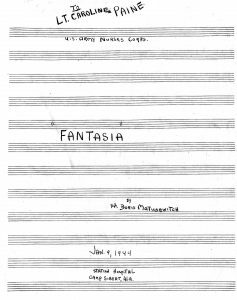 I recently came across a fascinating manuscript in my Matusewitch Family file: a piece titled Fantasia in [the] Style of the Masters composed by my father. 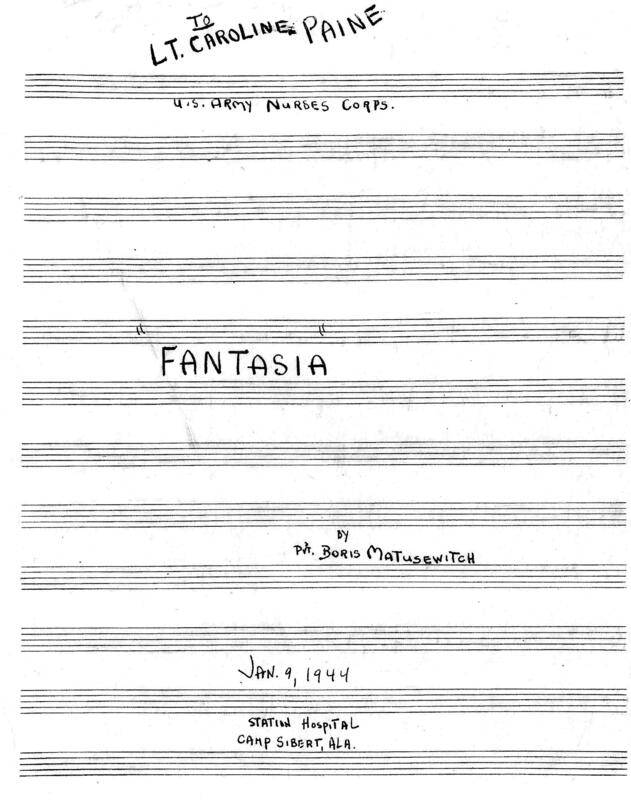 Dated January 9, 1944, it fills three pages of twelve-stave manuscript paper (ninety measures in all) and was written by “Private Boris Matusewitch” while he was recovering from pneumonia at Camp Sibert Station Hospital, Alabama. The piece is dedicated to “Lt. Caroline Paine” of the U.S. Army Nurses Corps, who cared for him while he was recuperating. Although no instrument is designated, I assume that the Fantasia was written for the treble English concertina. 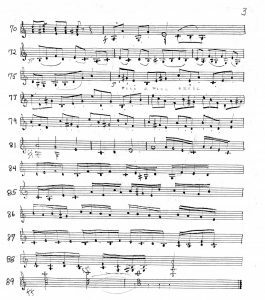 And while my father arranged many pieces for the instrument, this may be his only original composition. I vaguely recall that Lt. Paine sent me the piece many years ago. She may also have indicated—though I cannot be certain—that she took concertina lessons from my father while they both served at Camp Sibert. For sure, however, Boris gave concertina lessons to the camp’s commander, Brigadier General Haig Shekerjian. The manuscript raises a number of questions, some of which remain unanswered, at least for now. I have added measure numbers at the beginning of each staff in order to facilitate the commentary that follows. – meas. 1: the middle note of the grace note chord should be e’ (not f’ as written). – meas. 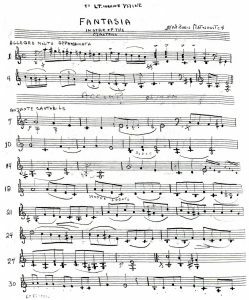 3: should the upper notes of the dyads on beats 2-3 read g’-sharp? – meas. 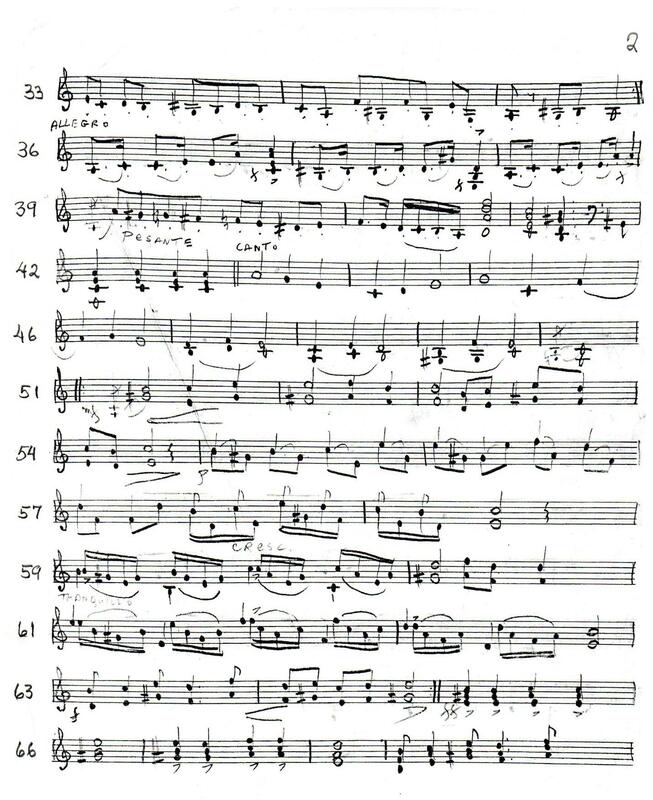 3, 5, 9, 41: the occasional appearance of notes in the bass clef is puzzling; clearly the treble concertina cannot play them (and Boris played no other version of the instrument); yet if we consider these brief volleys of low notes together with the inscription “ACCOMP” that appears on page 1/staff 4, perhaps we may speculate as follows: is it possible that these point to a piano accompaniment (or one for another instrument with a bass register), either one that was in the planning stage or that was completed but has been lost? Note that in each instance the notes in the bass clef imply a dominant (seventh?) 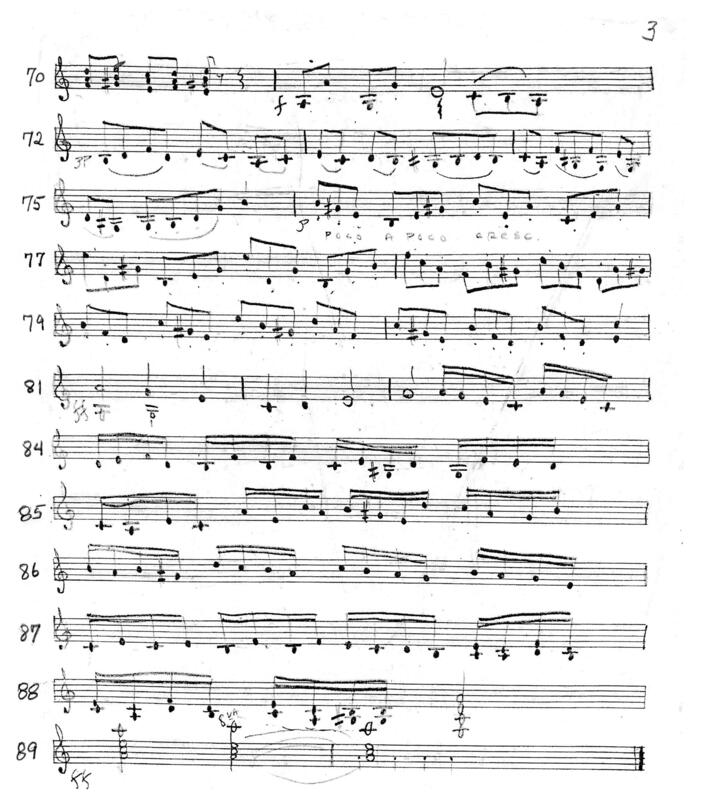 in the prevailing A minor, though the juxtaposition of the low G-sharp (bass clef) in measure 9 with the g’-natural in the concertina part on the downbeat of measure 10 is jarring (to say the least). As for the concertina in these spots: it probably rests. In the end, the snippets of music in the bass clef remain a mystery. – meas. 6: the dot is misplaced in what is clearly a combination of sixteenth and dotted-eighth notes on the first beat of the measure. – meas. 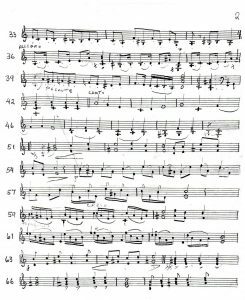 8-9, 17, 90: the most likely explanation for the cue-size notes in measures 8-9 and 17 is that they are ossia (alternative) passages, the choice of which to play being left up to the performer; on the other hand, it seems more likely that the four cue-size quarter notes in measure 90 are to be played beneath the sustained chord, with an added fermata over the last of them (it is hard to imagine ending the piece with the four quarter notes instead of the sustained chord). – meas. 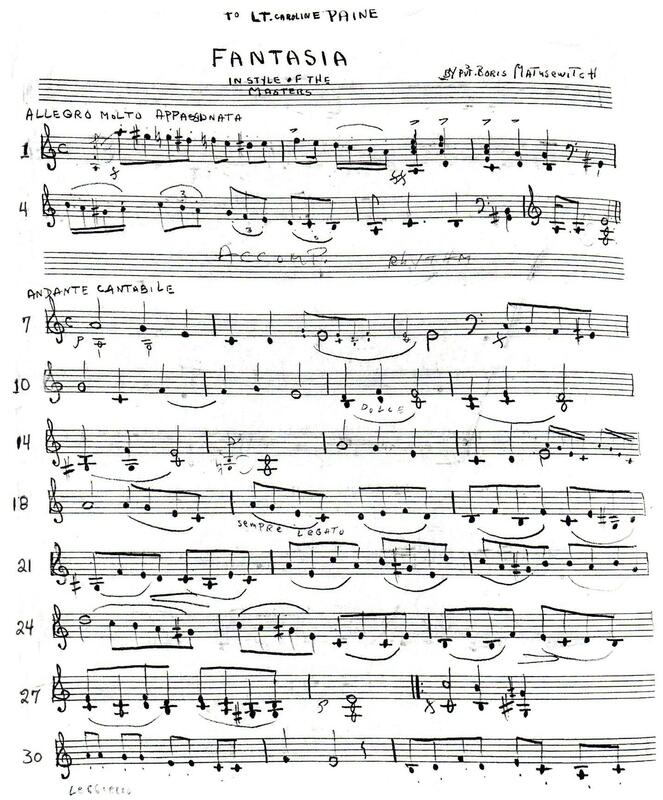 59: the final sixteenth in the third group of such notes should probably be an a’. – meas. 68: the lowest note is probably an f’, the intended chord being D-minor in first inversion (superimposed 4ths, e’ – a’ – d’’, would be stylistically out of place).